Fresh cherry season begins in May; but today is George Washington’s Birthday, a traditional occasion for cherry pie and other cherry recipes. We started the day with a Cherry Yogurt Parfait. Chobani, Dannon and Yoplait, among others, sell cherry-flavored yogurt; but one can easily make a more festive yogurt parfait. And we did! We prefer our parfait to a cup of cherry yogurt. What about canned or jarred cherries or cherry pie filling? You can mix cherries in water or light syrup into plain yogurt, but sweet, gloppy pie filling is over the top. 1. COMBINE the yogurt and cherries in a mixing bowl, in your preferred proportions. Reserve a few cherries as a topping for the parfait. Stir to combine. 2. SCOOP into a dessert dish, parfait dish, Martini glass or other festive vessel. Garnish with the reserved cherries and serve. In the “normal” way—as a yogurt parfait. Atop dry cereal (we eliminate the milk, and enjoy the cereal at its crunchy best). As a topping for pancakes or waffles. As a garnish for fruit salad. Spooned over pound cake or angel food cake. 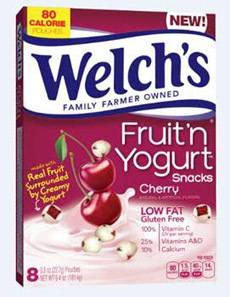 Pick up some Welch’s Fruit & Yogurt Snacks in the new Cherry flavor. 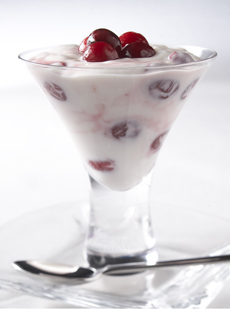 Top: Make a Cherry Yogurt Parfait like this one from ChooseCherries.com. Bottom: Want something that’s grab-and-go? Have fun with these yogurt-covered cherry snacks from Welch’s. Small, round and chewy, they are, alas, addictive. There’s more information on the Welch’s Fruit Snacks website.